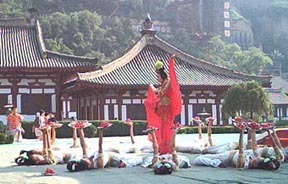 Xi'an is a former capital with a rich history and growing contemporary importance. It was also our home from August 2002 to August 2005. 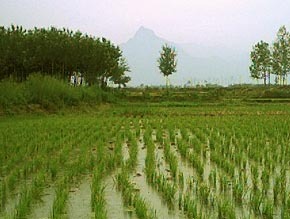 The area has been China's capital several times, starting in about 200 BC. During the Tang dynasty (particularly from AD 618 to the late 700s), this city (then called Chang An) was probably the largest and most prosperous city in the world.  As the starting place for the Silk Road, the city has long been a center for the exchange of both goods and ideas between East and West. From the 6000-year-old ruins unearthed nearby, to dozens of tombs left by the many dynasties that had capitals here, Xi'an has provided important clues into China's past. 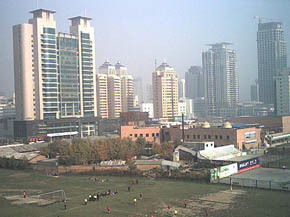 With over 6.5 million people and the continual construction found in all of China's cities, Xi'an has plenty of dust and pollution--which have been hard on our health--but the city also has a lot going for it, both in terms of history and as the "door" to China's vast central and western regions. Michael first visited Xi'an with his parents in the late 1980s, and it had certainly changed by the time Vivian and Andrew first saw it in 2000! The above photo shows the nearby mountains, looking south from our apartment roof. 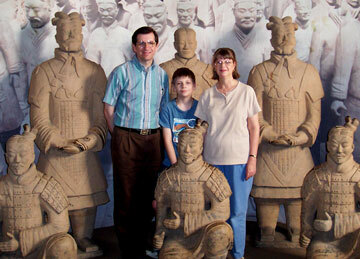 Click here to read a student's overview of Xi'an. 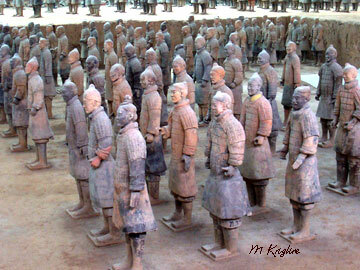 To the outside world, Xi'an is most famous for the nearby Terra-cotta army of China's "first emperor," Qin Shi-huang. He was certainly one of history's most ambitious leaders, for he is credited with unifying various warring kingdoms, constructing the Great Wall, building the largest palace in the ancient world, and creating this tomb containing thousands of life-size soldiers to guard him in "the next life." The exquisite clay army lay silent in their underground formation from 200 BC until 1974 when several farmers discovered them by accident. 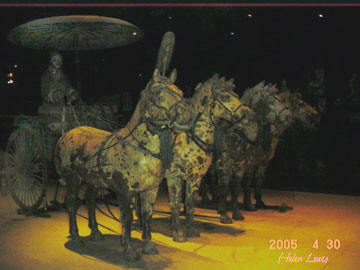 In addition to the clay soldiers and horses, two bronze chariots were also buried (below left). This is a UNESCO world-heritage site, and Chinese officials are to be commended for their work in patiently unearthing and reconstructing the figures, and carefully protecting one of the most important archeological discoveries of all time. I'm also glad that the ban on taking photos had been lifted before our 2005 visit! 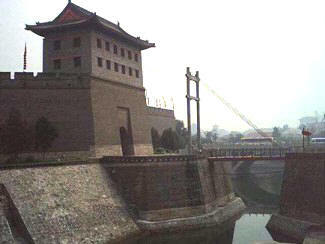 (below left) Xi'an still has a huge wall going all the way around the city (it's one of the best-preserved city walls in the world). 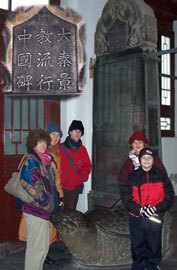 (above) Just before Christmas 2004 we visited the oldest museum in China (the Forest of Steles in Xi'an). The Nestorian tablet, seen here, dates back to the mid to late 700s (AD) and gives important details about some of the earliest Christians who had a positive relationship with China's leaders (Xi'an was the capital back then). The tablet lay buried for 1000 years before being found in the 1600s. Click here for related photos/info. 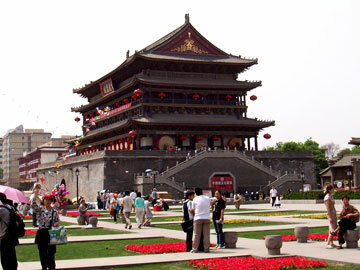 (left) This Bell Tower has served in central Xi'an since the 1300s. 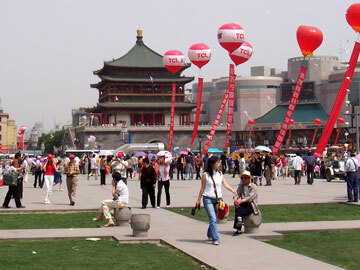 Across the pubic square, you'll find the Drum Tower (right). Both buildings were renovated while we lived here, as the public and private sector work to make the downtown area a beautiful place to shop or visit. Xi'an has several shopping centers, including the one seen behind the Bell Tower, and an upscale shopping mall UNDER this square! The first photo was taken on the outskirts of town. The photo on the right was taken, looking northeast from our apartment roof into the High Tech Zone. The center view (actually the same view shot twice) was also taken from our apartment roof, looking south toward the mountains we could see about six times a year. 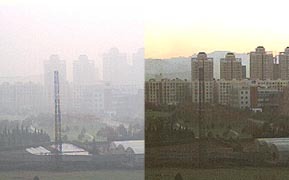 Normally we could barely see the buildings (much less the distant mountains) through the haze and pollution (as shown). This pollution gave us bronchitis and eventually pneumonia, and was the main reason we had to leave the city. 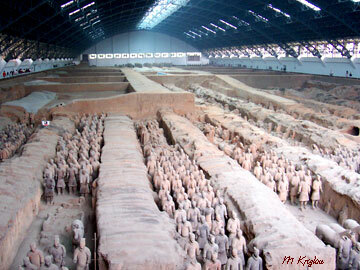 In addition to its famous terra-cotta army, Xi'an also has many other ancient tombs, palaces and temples. It has one of the best history museums in China, a wonderful bird park, and beautiful natural areas in the nearby mountains. It's really a great place to visit!